You can get a list (Up to 1000 calls long) of calls that have been made to and from the system. 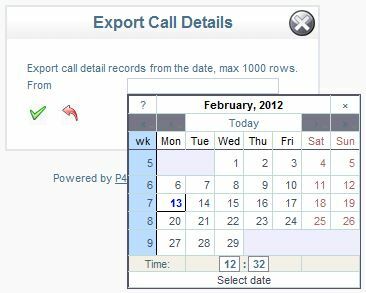 Using the calendar, select the date and time for the first record you want to export, and click the tick. Call Records will be exported to a CSV file, and downloaded to your PC. Don’t forget to look at our Netvibes gadgets for off the shelf reporting - hopefully saving you time. Click the tick again and it will subsequently download the next 1000 records. Keep going until you have all the csv’s you need. Then to stitch them all together, make sure the CSV’s are all in the same folder, and download the script to do this, click here. This will download a file called run.cmd, make sure it is downloaded into the same folder as the CSV’s. Then all you need to do is, run this file and it will create a combined CSV called combined.csv.